● The card payment Rakuten has been using a system called SSL. ● On our credit card payment system, credit card receipt is not issued. ● Please check your usage details to be sent from the card company. ※ Depending on the state, such as your use, you might change to other means of payment. ※ If you want to ask (such as phone verification) to confirm your identity when you order more than JPY100,000. ※ Use of credit card in the name of different customers and I can not. ■PayPal is only payment method for international customers. ■Shipping will be withEMS (Express Mail Service). * In the case of using Rakuten Super points, total bill amount on automatic reply mail from Rakuten Ichiba may be different. Please check the mail from our shop for the correct amount. ■We will ship after the payment is settled. 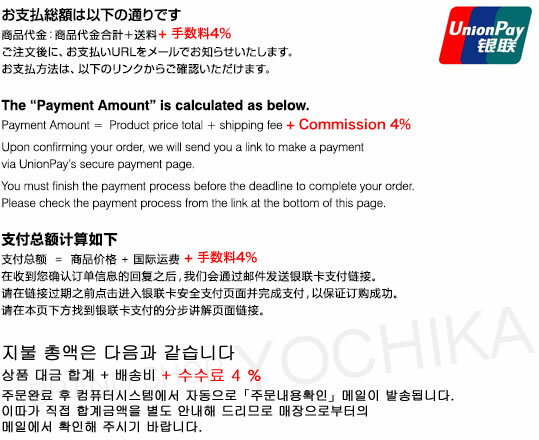 ■You will receive an e-mail regarding the payment via PayPal. Please click the link to the PayPal website on the e-mail, and settle the payment within 3days. ■Please also be reminded that if we cannot confirm receipt of your payment to our PayPal account 3days after the above e-mail is sent, your order shall be automatically cancelled. ■Customs duty and other taxes may be levied when the shipment reaches your country. If applicable, please pay those costs directly to the delivery agents or the customs office. Policies on those taxes vary in each country. Please contact the customs office at your country for more details. ■Tariffs at the time of receipt will not be able to bear in our shop. ■Any return or refund will not be accepted for overseas delivery once order confirmation e-mail is sent out. ■Please keep a copy of your payment. Shipping will be with EMS (Express Mail Service). Please note that the shipping fees mentioned in this e-mail are for orders to be delivered to an address within Japan and not applicable for deliveryoutside of Japan.